"Well, what good will that do? You are buried alive in the heart of this glacier. Time is desperately short. You've got no time to bargain over hostages!" GARRETT: The Doctor. You heard what he said. CLENT: Regardless of the consequences. Yes. Yes, he's telling us to take the risk. GARRETT: But we can't give the computer the information it needs. It can't instruct us. CLENT: Can the ioniser hold? GARRETT: At present power it's steadily losing ground. But we dare not increase. COMPUTER: Summary of orders to all World Ioniser Stations. The new equation originated from Brittanicus Base will be adopted to conditions prevailing in each sector. All bases will prepare to use full ioniser attack on the ice in concerted action. Zero hour in six hours exactly. Report readiness one hour. CLENT: We can't do it. GARRETT: But if we don't the whole plan must fail. GARRETT: We must state our problem to World Control, now. CLENT: No, wait! We'll give our computer all the information we have. CLENT: It may be. It may be. GARRETT: I know what the computer will say. CLENT: No, no, no, no, no. Let the computer speak for itself. GARRETT: There's only one answer it can give. CLENT: Come on, quickly. Put the situation to the computer. Do as you're told! COMPUTER: Set up all circuits to new equation and wait. Further information essential before decision can be taken. Prepare to notify World Control in event of emergency. CLENT: Of course, the computer's right. We must be prepared, and we must wait. GARRETT: It is the answer I expected. CLENT: But you don't realise why it made this choice, do you? GARRETT: Because it is the most logical answer in the circumstances. CLENT: Of course. And because it's so logical, it can't gamble. It can't take risks. GARRETT: That is its function. To be totally impartial. To serve the community. CLENT: Exactly. And one more aim in its life, to survive. GARRETT: It has given us its decision. GARRETT: The computer is destroyed. CLENT: So that, by demanding a decision, we are asking it to commit suicide. GARRETT: It can't do that! CLENT: Then what is the answer? GARRETT: We can escape. There's still time to evacuate. CLENT: Perhaps you could face world opinion. I couldn't. GARRETT: You must notify World Control eventually. The other bases will be waiting. CLENT: I will decide exactly when. For now we do as the computer says. Prepare the ioniser and wait. CLENT: Well, what do you feel about all this, Walters? Bet you didn't think you'd have ice monsters and things like that to deal with when you volunteered for the job, did you? Well, did you? CLENT: Ah, yes. Well, good man, anyway. Conscripted? Here as a punishment? We just don't know. JAMIE: Look, you've got to help. CLENT: Yes of course, boy. Walters will take you to the Medi-Control Centre. JAMIE: No, I didn't mean me. I meant Victoria and the Doctor. Look, they're inside the alien spaceship. You've got to help them! JAMIE: Well it must be. You've got to do something. CLENT: No, we lost contact with the Doctor over an hour ago. I'm afraid there's no hope. PENLEY: You mean hope happens to be inconvenient. You've got to stick to your precious schedule, is that it? You've got to wave your splendid ioniser about to prove that it works and never mind about human beings. GARRETT: The computer has decided. PENLEY: The computer? Override it. Let the ioniser wait. The computer isn't going to fall apart because it has to mark time for an hour. CLENT: We are marking time. We're not using the ioniser under instructions from the computer itself. GARRETT: The spaceship may contain a reactor system that could wipe us off this island if we cause it to explode. PENLEY: So what are you going to do? CLENT: We obey the computer. We will wait. PENLEY: Wait? But that's suicide. The glacier's practically on top of us. CLENT: We still have time in hand. PENLEY: If the Doctor doesn't contact you, then what hope is there? PENLEY: Oh don't be a fool, Clent. You're not a man, you're just a machine slave. CLENT: Don't you spit your stupid liberty in my face, Penley. We know your kind of freedom. Freedom to run away from responsibilities, from service, from moral judgement. I may be a physical coward, Penley, but you're a coward in the mind. PENLEY: Well at least I have a mind and not a transistorised junction box. I would act, but you daren't. And so you're going to be destroyed along with your mechanical master. JAMIE: Look, you've got to help us, man. CLENT: There! Now, get them out of here! GARRETT: You'd better take them to the Medi-Control Centre. Get someone to look at the boy. Make sure there's a guard for when they come to. WALTERS: Right. Send two guards to control. GARRETT: Our trust is in the great computer. With its aid, we cannot fail. 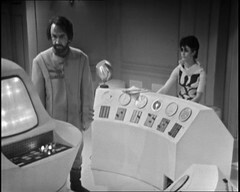 On the other hand I'm loving Troughton and Victoria with the Ice Warriors, that's superb stuff even if the Ice Warrior spaceship is a couple of consoles in the middle of the floor and some background flats. VARGA: So you are afraid of us. DOCTOR: No, but of your ship. If the ioniser sets off a nuclear holocaust, it will all have be in vain. VARGA: That is good. In that case you dare not act. ZONDAL: But if you thought there would be no explosion? DOCTOR: Well, in that case we'd have no choice. VARGA: You would use the ioniser. DOCTOR: But it wouldn't harm the ship. It would release it. ZONDAL: There would be floods. VARGA: Our engines would be useless. ZONDAL: We would be at your mercy. VARGA: Why did you come here? ZONDAL: To spy? To betray us? VARGA: But you could not hope to escape to tell the tale. DOCTOR: Oh, I always live in hope. VARGA: You have some kind of communicator. DOCTOR: You do realise, don't you, that after a certain point, my base will have to activate the ioniser regardless of the consequences? VARGA: And destroy you and themselves as well? What you can't see from the above conversation is that mid sentence it cuts from Doctor menaces by Ice Warriors to Clent & Garrett monitoring the conversation in the base! A nice touch from director Derek Martinus, who'd previously worked on Galaxy 4, Mission to the Unknown, The Tenth Planet and The Evil of the Daleks. 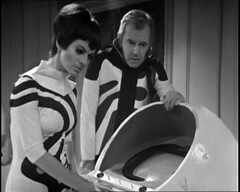 He'd later return for the very first colour Doctor Who story, Spearhead from Space, which introduced Third Doctor Jon Pertwee and would also direct two episodes of Blake's 7: Trial and The Keeper. In fact he repeats a trick here I noticed when watching the recovered episode of Galaxy Four: he's using height a lot here at one point shooting above Zondal down toward the communication console displaying Varga's image. VARGA: Close engine room. Well? DOCTOR: It's an ion reactor, isn't it? Hmm. It could be dangerous, but it wouldn't necessarily explode. VARGA: True. But your friends do not know that. DOCTOR: Now why don't you let us help you? VARGA: We can get what we want without your help. DOCTOR: But what else do you need, apart from escaping from the ice? VARGA: We have had enough of your questions. Now you will give me answers. DOCTOR: Well, I've told you all I can about the ioniser. VARGA: That is only a toy. The base. What is its power source? DOCTOR: Why on earth do you want to know that? DOCTOR: Oh, so that's what you need, is it? ZONDAL: Answer the Commander's questions. DOCTOR: Fuel! Fuel for your reactor! And suppose I don't tell you? VARGA: The girl dies now. VICTORIA: Doctor, don't tell them. DOCTOR: Yes, you'll find what you need at the base. 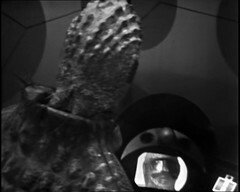 DOCTOR: But you won't find Leader Clent easy to persuade. He's a very obstinate man. VARGA: He will listen to our sonic cannon. ZONDAL: We must act quickly, Commander. VARGA: Isbur and Rintan, wait for me at the entrance to the cave. Zondal, you will man the sonic gun. VICTORIA: You won't succeed. You can't be so inhuman. VARGA: We only fight to win. DOCTOR: We can try and escape with this. VICTORIA: Ammonium sulphide? It's only a stink bomb. DOCTOR: Yes, you've had the benefits of a classical education. Yes, it is what you'd call a stink bomb. VICTORIA: What use is that? DOCTOR: You'd be surprised. Harmless to humans, but to aliens very possibly deadly! I am somewhat amused by the possibility of Victoria learning about stink bombs at school! We'd previously noted Jamie's ability to read. It appears he's been putting it to good use and has read The Scottish Play! PENLEY: I'm not exactly a man of action myself. Storr should be here now. I miss him. JAMIE: Have you no weapons? PENLEY: Arden's tranquilliser gun, that's all. JAMIE: Aye, it's not much. PENLEY: Storr was a huntsman. An expert with a bow and arrow. JAMIE: It's no good wishing. PENLEY: Well, I'd better carry on. JAMIE: Aye, lead on McDuff. JAMIE: Well, the gun. Use the gun. PENLEY: I couldn't hit the side of the mountain. I'm a scientist, not a gladiator! Still two years ahead of the UK début of Star Trek! This is writer Brian Hayles' third Doctor who story after The Celestial Toymaker & The Smugglers. From now on he would only write for the Ice Warriors in Doctor Who penning their three return appearances in Seeds of Death, Curse of Peladon and Monster of Peladon. 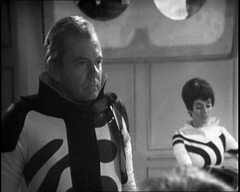 Outside of Doctor Who he wrote an original story, 1+1=1.5, for the third season of Out of the Unknown. 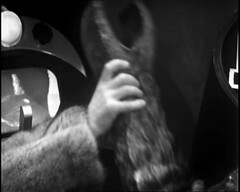 Sadly that episode no longer exists but his adaptation of Angus Hall's Deathday for the fourth season does and can be seen as part of the Out of the Unknown 7-Disc DVD Set. 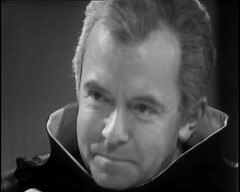 He also wrote two episodes of Kit Pedler & Gerry Davis' Doomwatch, The Iron Doctor and Hair Trigger, both of which exist. 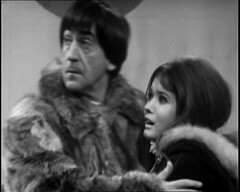 His last writing job for the BBC was The Moon Stallion which featured a young Sarah Sutton, later to play Doctor Who companion Nyssa. 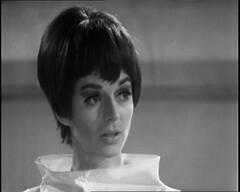 Hayles died on 30 October 1978 a few weeks prior to The Moon Stallion's broadcast. 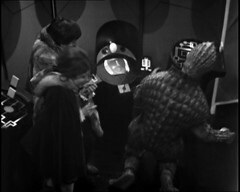 When I was growing up and first became interested in Doctor Who (c1980/1), The Ice Warriors sat at number three in the monster pantheon, obviously behind the Daleks & Cybermen. They've slipped somewhat now: They didn't feature in the original series since 1974 whereas the Sontarans made three return appearances in classic Who after that date followed by some in the new series. 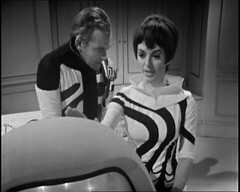 Likewise original Doctor Who monsters The Autons and The Silurians have made several new series appearances. 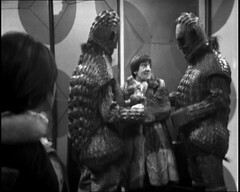 At the point I first blogged this story the Ice Warriors were easily the biggest original Who monster yet to appear in the new series. Since then they've made a long awaited return in the Mark Gatiss penned Cold War. 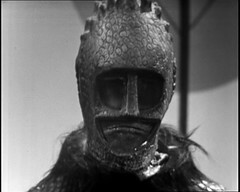 I'm increasingly convinced I'm not quite the right audience for this newer version of Doctor Who but they didn't do too bad a job here.... except when Ice Warrior Skaldak shed his armour and was revealed to be a swiftly moving almost Alienesque creature which just didn't fit with everything else we've seen of the Ice Warriors over the years. Yes we know what we can see here is armour with little of the creature, bar it's mouth visible but somehow what was revealed on screen just didn't feel right! That's FOUR of the original series greatest monsters in consecutive stories! You won't see that many returning monsters line up one after another like this ever again. The best we get is in 1972 when the Daleks, Ice Warriors and Sea Devils, the Silurians cousins, appear in Day of the Daleks, Curse of Peladon and The Sea Devils at the start of season 9 or in Season 12 in 1975 when the Sontarans, Daleks & Cybermen appear in the Sontaran Experiment, Genesis of the Daleks & Revenge of the Cybermen. And before anyone says something: The Master, like Davros, is a Villain, not a Monster - there's a difference!